Validating balanced parenthesis, brackets and braces inside a mathematical equation. Today, I will try to create a C# method that would validate if the brakcets, parenthesis and braces of a given mathematical equation is properly written, balanced and complete. 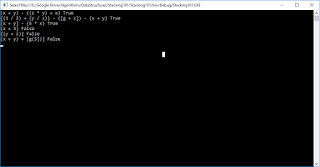 The goal of this excercise is to utilize the stack data structure to write an algorithm with a linear growth. Any suggestions on how to do this using logarithmic algorithms are welcome.